On a cloudless day in September 2001, New York's CBS2 broke into normal programming for a breaking announcement. "Good morning, Michael Pomeranz, along with Lisa Hill, some breaking news to report," the announcer Pomeranz tells viewers as the camera shifts from the studio to a live shot of lower Manhattan, "you're looking at a live picture of the World Trade Center. We have just received word that a plane apparently has crashed into the tower, one of the two towers." With those words, Pomeranz opened his station's coverage of that horrific day, Sept. 11, 2001. He stayed on the air for hours afterward, helping to keep a city informed of the unfolding disaster and terror attack. Years later, after he moved from news a new career in baseball, as a broadcaster for the San Diego Padres, Pomeranz recalled the events of that day to The San Diego Union-Tribune. "It gives us all a different perspective in life going forward," Pomeranz told The Union-Tribune on the 13th anniversary of the attacks. "I'm no different than anybody else in that way." Years earlier, CBS2's morning anchor on Sept. 11, 2001, had gotten his start in baseball - as a player. Pomerantz played four seasons in the minors before an shoulder injury ended his career. He started his news career by 1994 and he quickly worked his way up to the nation's top media market in New York. 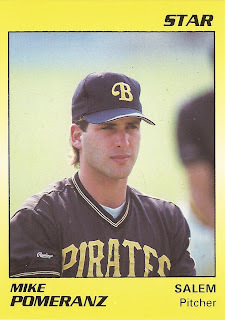 Pomerantz' baseball career started in 1988, taken by the Twins in the 13th round of the draft out of Clemson University. He started with the Twins at rookie Elizabethton. He went 2-6, with a 5.07 ERA. He moved to single-A Kenosha for 1989, where he went 4-5, with four saves and a 4.54 ERA. That off-season, Pomerantz returned to his old high school, South Broward in Florida, to serve as a volunteer assistant coach, according to The South Florida Sun-Sentinel. "A lot of people helped me. It's the least I can do," Pomeranz told The Sun-Sentinel. "I try to teach them something we didn't get when we were in high school." After a trade, Pomerantz played the 1990 season with the Pirates at high-A Salem. In 35 games, three starts, he went 3-7, with a 6.90 ERA. He isn't recorded as playing in 1991. He returned with the Orioles for one last season in 1992, at single-A Kane County. He got into five games there to end his career. Pomerantz soon earned a new degree, from the Walter Cronkite School of Journalism at Arizona State University. He then took anchor jobs in Knoxville, Colorado Springs and in Chicago. He then arrived in New York. After the South Tower collapsed the morning of Sept. 11, Pomerantz updated the viewers on the enormity of what they were seeing. "No word right now on the extent of the casualties," Pomerantz told viewers, "but clearly, they are substantial." Pomerantz stayed in New York into 2005, when he made the move to Minneapolis and the evening. He signed on with KARE to anchor their 5, 6 and 10 newscasts. "Michael fits KARE's style perfectly," KARE vice president news director Tom Lindner said in a release upon the hire. "He helps make every story clear with a straightforward style and a comfortable, natural presence." He joined the Padres in 2012 as a broadcaster and he remains there in 2018. In March 2014, he sat down for an interview with the newest Padre Eric Hosmer. YouTube, CBS2, Sept. 11, 2001: 8:50 a.m. - 9:20 a.m.
YouTube, CBS2, Sept. 11, 2001: 9:50 - 10:19 a.m.